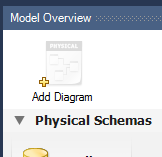 On the MySQL Model screen, double-click the Add Diagram icon (shown in the following figure). This action creates and opens a new EER Diagram canvas. From an EER diagram page you can graphically design a database.